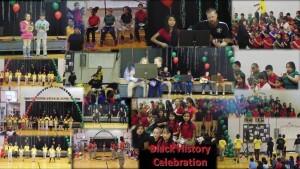 Winchester Village Elementary held its annual Black History Celebration. The celebration included visitors from the John Marshall High School JROTC and the Tanzamanim Dance Academy. Students shared black history quotes and presented reader’s theater a tribute to people of character. The WV Guitar Club performed. WV Drill team also performed. See all the fun we had as we celebrated Black History Month.